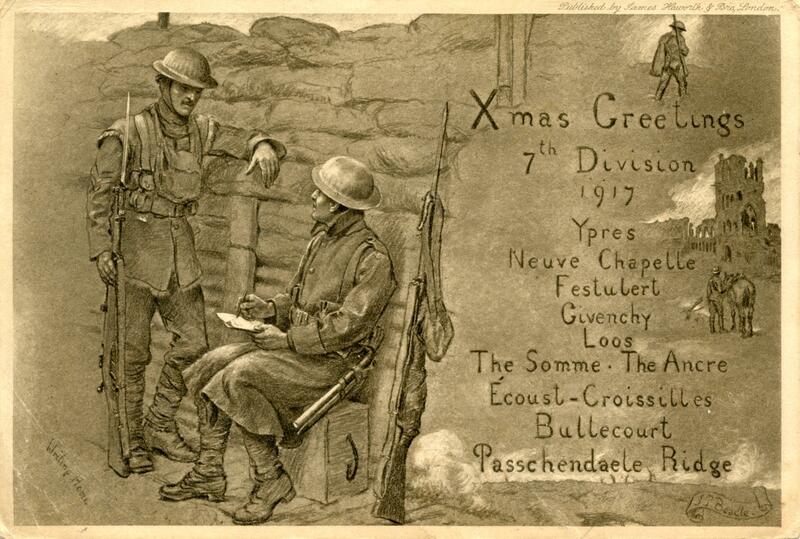 Artist James Prinsep Beadle produced three wonderful Christmas cards for the 7th Division BEF during the First World War. The 1917 postcard pictured above was sent by Thomas Harold Chapman, a Private in the 21st Field Ambulance of the Royal Medical Army Corps, to his Gran back in Britain. Beadle was born in India in 1863, the son of Major-General James Pattle Beadle, and studied art in London and Paris. He had a particular interest in military subjects and painted a handful depicting scenes of the First World War although little is known about his drawings used on these 7th Division Christmas cards. 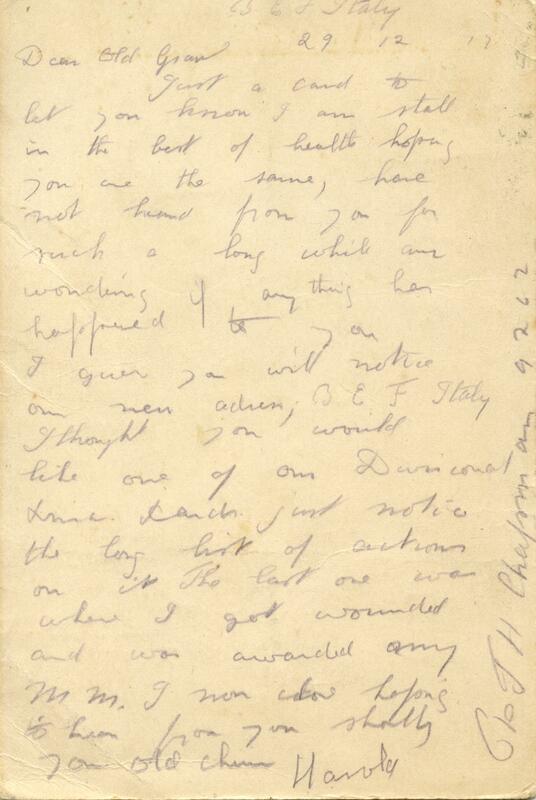 Each postcard lists the 7th Division’s Battle Honours for the year and young Thomas Harold Chapman drew his grandmother’s attention to the last entry for 1917, Passchendaele Ridge, “where I got wounded and was awarded my MM.”. The card is dated December 29, 1917 and was written from Italy where the 7th Division had recently moved in order to support the Italian war effort after that country’s enormous losses at the Battle of Caporetto. Chapman was born on January 21, 1897 in Ilkeston in Derbyshire, one of eight children, to salt dealer Thomas and his wife Mary. 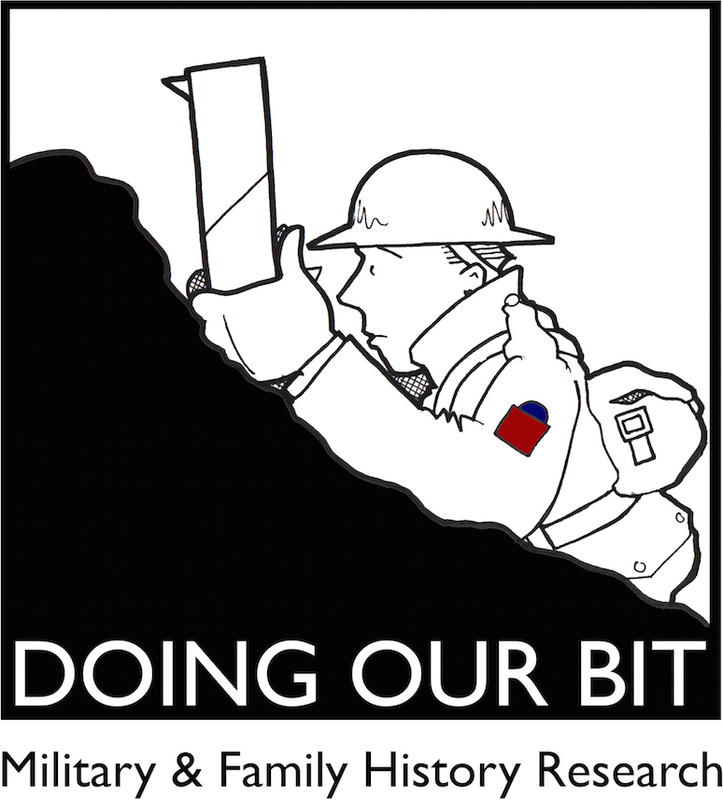 Although his First World War service record has not survived his Medal Rolls Index Card has. It reveals that he signed up as a 17-year old in 1914 and received the 1914 Star, British War Medal and Victory Medal. This is in addition to the Military Medal that was announced in the London Gazette on December 17th, just 12 days prior to his penning the note to his Gran. Thomas survived the war and married Minnie Shelton in 1921 with whom he had three daughters. I’ve been corresponding with his descendants in Perth, Western Australia and they very kindly allowed me to share this snowy photograph of Thomas and family in Britain in 1962.